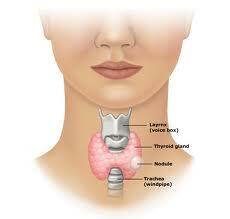 The Thyroid Gland is in the lower middle part of your neck in front of your windpipe ("Trachea"). It is shaped like a butterfly with one wing ("Lobe") on either side of the Trachea connected in the middle by the body ("Isthmus"). The Thyroid Gland produces a hormone ("Thyroxine") which is very important in controlling your body's metabolism. Thyroid Cancer is the fastest growing type of cancer today and is now more common than Leukemia. Fortunately, it is very curable if found when it is small and before it has spread outside the Thyroid Gland. On the other hand, Thyroid Lumps ("Nodules") are very common and most are not cancer. Therefore, figuring out which Thyroid Nodules might be cancer is very important. Since most Thyroid Nodules do not cause any problems and cannot be easily seen or felt, they are usually found during routine examination by the Primary Care Doctor. Others are found when imaging, like a CT Scan or Neck Ultrasound, is done for some other reason. Generally, a Thyroid Nodule larger than a half inch, especially if it is solid or partly solid, should be investigated by performing a needle biopsy. Thyroid Removal or Thyroidectomy is indicated for a Thyroid Nodule which is suspicious for cancer. Depending on how suspicious your Head & Neck Surgeon is that a Thyroid Nodule is cancerous, either part ("Partial Thyroidectomy") or all ("Complete Thyroidectomy") of the Thyroid Gland is removed. Dr. Lueg performs Partial Thyroidectomy in about an hour while you are asleep under anesthesia. 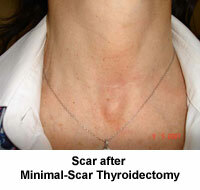 His technique, Minimal-Scar Thyroidectomy, often results in a scar less than 2 inches long. Dr. Lueg has performed hundreds of thyroidectomies and most patients go home right after their surgery without having to stay in hospital overnight.